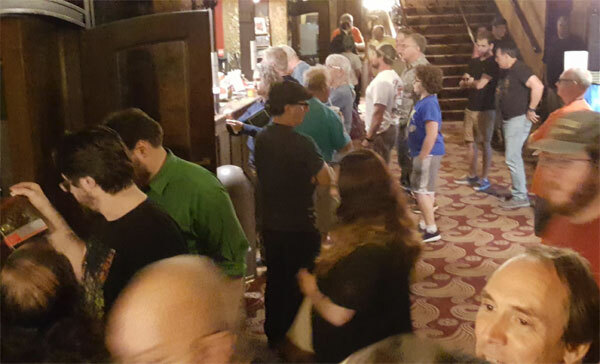 The 2nd Monster Bash Movie Marathon took place at the grand Palace Theatre in Canton, Ohio. 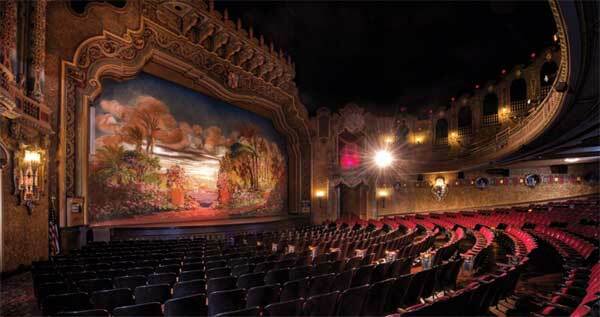 A festival of GIANT monsters on a giant movie screen. 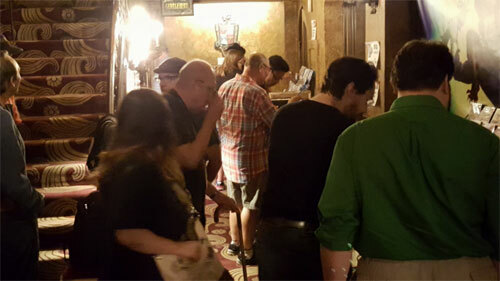 Vendors filled the lobby and the mezanine level of the theatre. Just super fun time with attendance almost doubling from the first marathon. We hope you'll make the next Monster Bash! CLICK HERE for details. 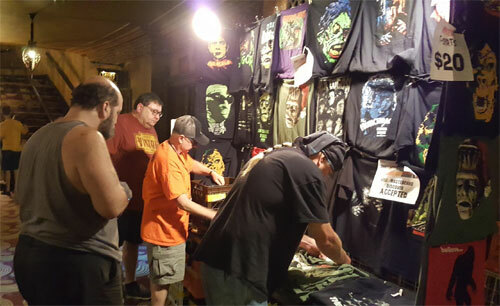 Above: Monster Bash's Bob Kennedy with t-shirt shopper in the lobby of The Palace. 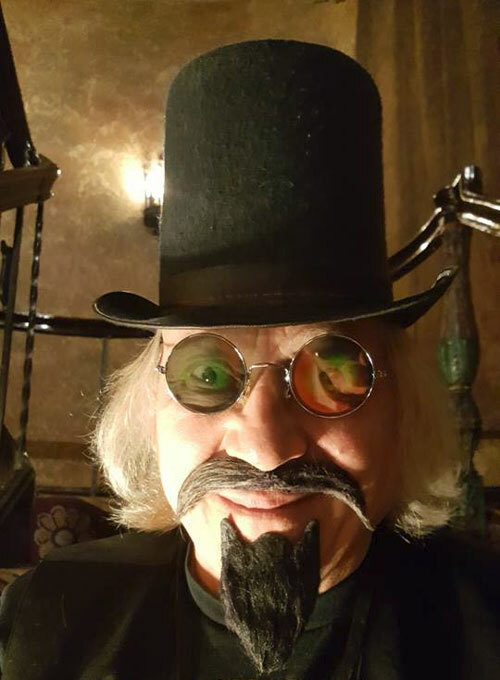 Above: Ohio's TV Horror Host, Son of Ghoul at The Palace. Above: An intermission at the theatre. 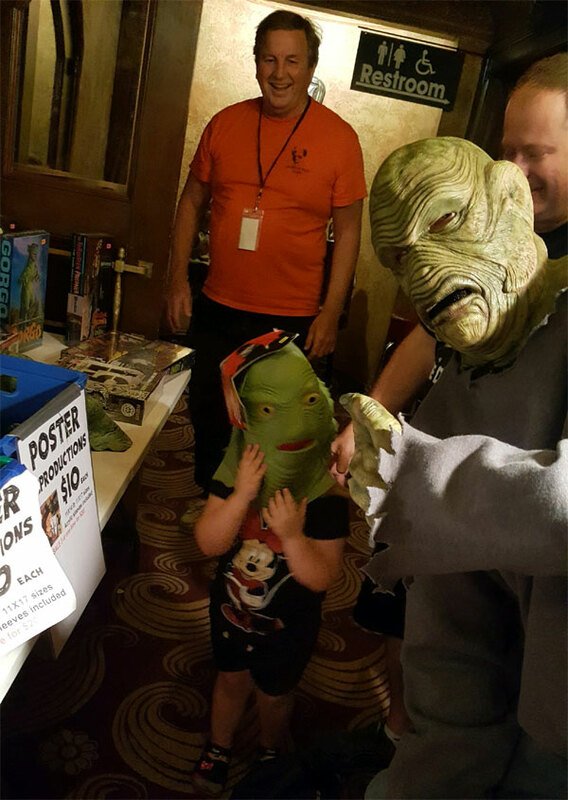 Note the kid wearing a monster-lizard hat! 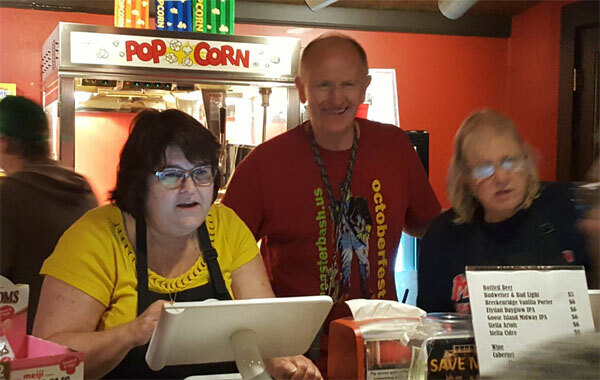 Above: At the popcorn concession, The Palace's Jay Spencer and friends. Busy! Above: Shoppers at the Monster Bash Movie Marathon. Above: Checking out the latest classic moonster blu-rays and DVDs at the marathon. Above: Monster Kid heaven on the mezzanine level of the theatre. Collectibles...cheap! 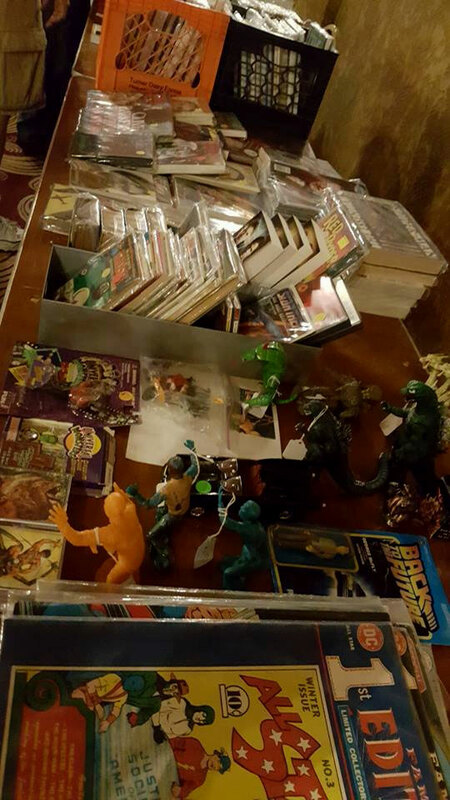 Plus, whole collections for sale. Wow! 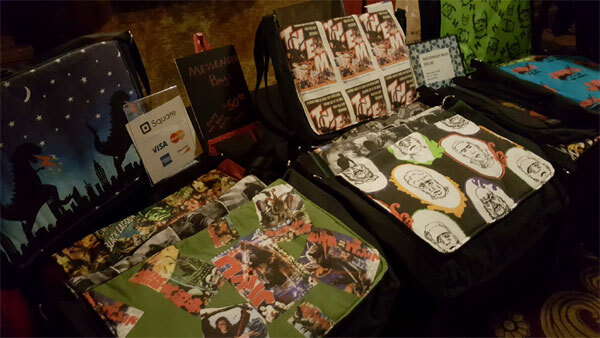 Above: Custom shirts, bags, computer cases...all from Monser Bash vendor Terri Mount. 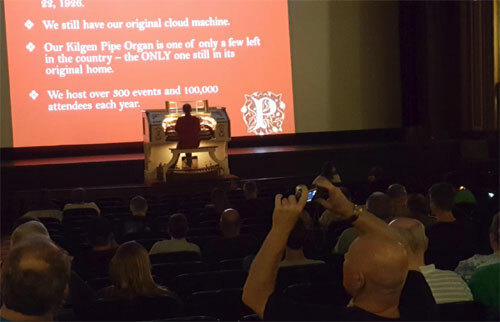 Above: On intermissions, The Palace Theatre's Jay Spencer plays a real pipe organ, shaking the walls! Above: A view coming down from the west wing balcony into the monstr fan filled lobby. 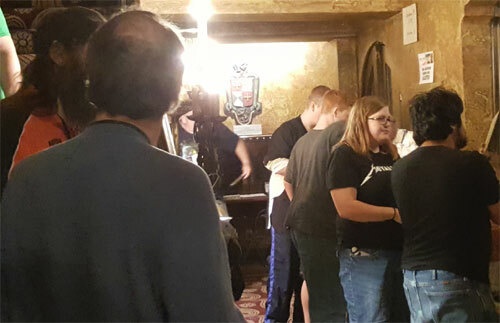 Above: Monster Kids from many different states talked with other fans. 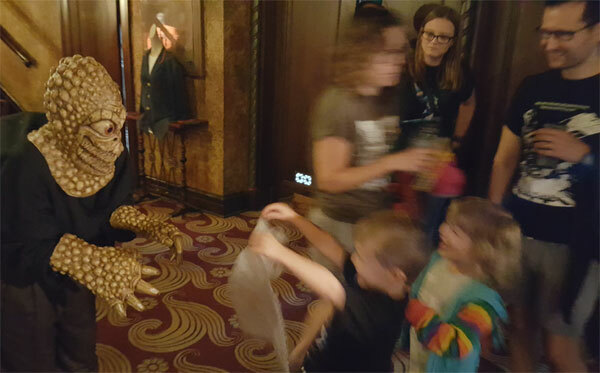 Above: What a great shot of a wary, young attendee looking down into the lobby that was invaded by people made up as classic monsters. Above: Kids having fun playing with Monster Bash's Mole Man. 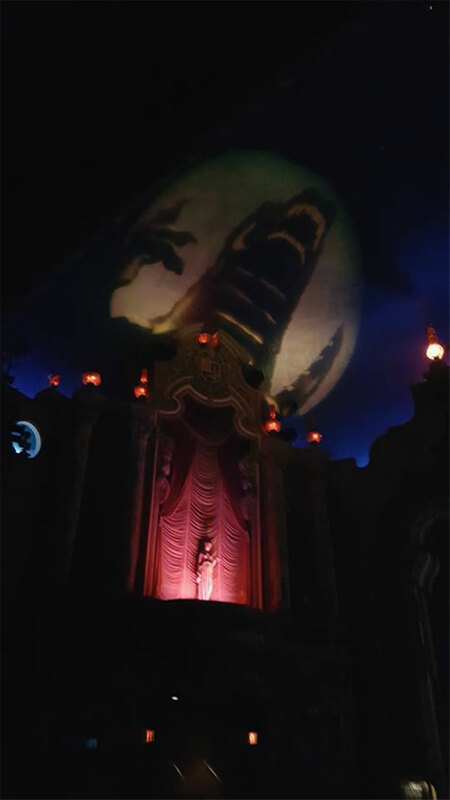 Above: In the darkened theatre that seats 1600, the King of the Monsters rises above on a special, custom projection on the theatre's ceiling. 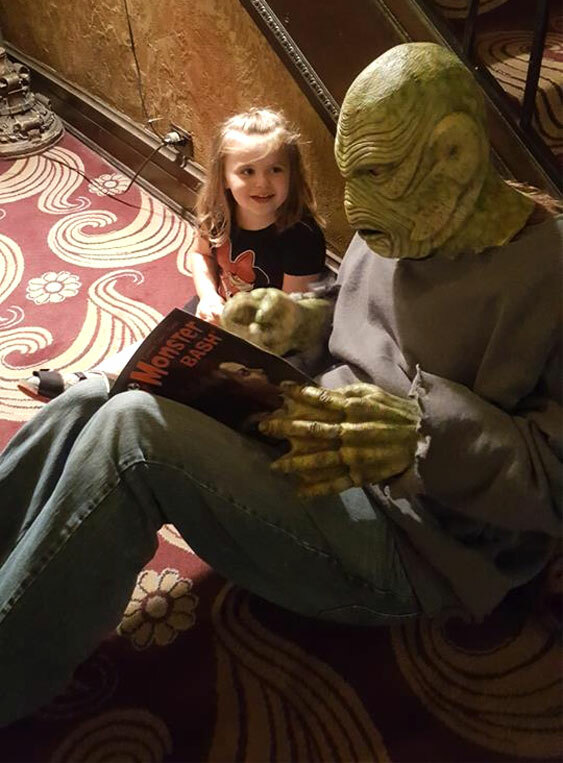 Above: During one of the features, young Rayleen stopped ut to the lobby to hang with Monster Bash's Gillman. 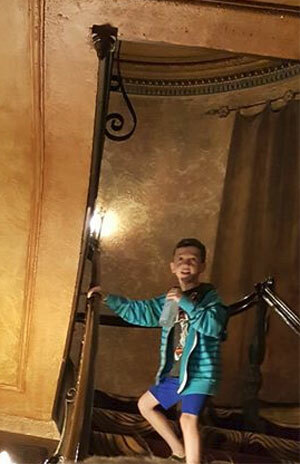 Above: Big Creature and Little Creature at the movie marathon. Monster Bash's Joe Russell laughing in background. Above: Producer attacked from underworld dweller! 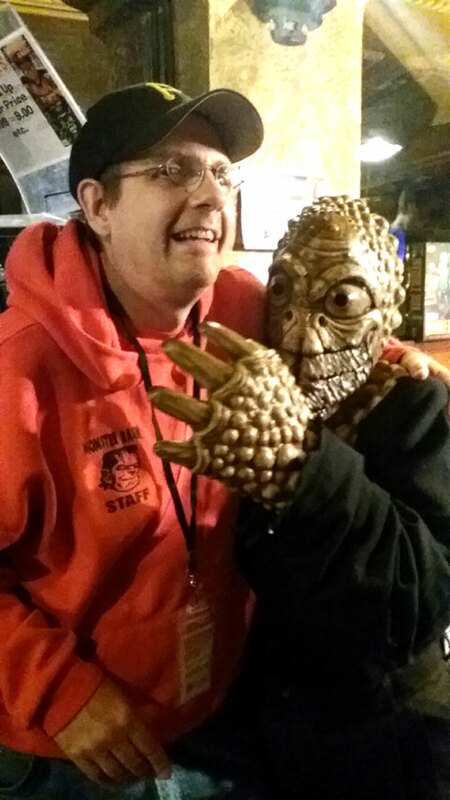 Actually it's Dad and daughter (Paisley Adams as The Mole Woman). 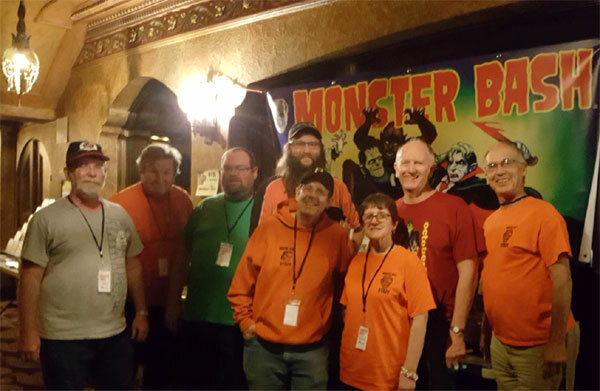 Above: Just some of the great Monster Bash crew -- Ken Kramer, Joe Russell, Leonard Hayhurst, Dan Weber, Ron Adams, Susan Sherry, Jay Spencer from The Palace Theatre, and Bernie Sherry. Not pictured staffers on-site: Ursula Adams, Paisley Adams, Jon Doerr, Bob Kenedy, Bob Pellegrino, John Sargent...and helpfull I'm not forgetting someone! Also a BIG thank you to Chris and Adam of the theatre crew! 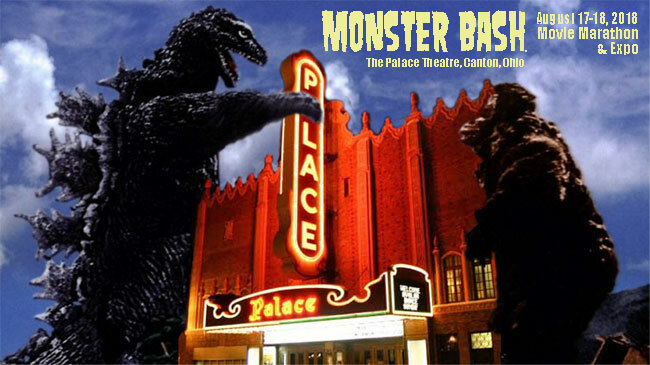 Above: The Palace Theatre in Canton, Ohio...home of the Ohio MONSTER BASH! 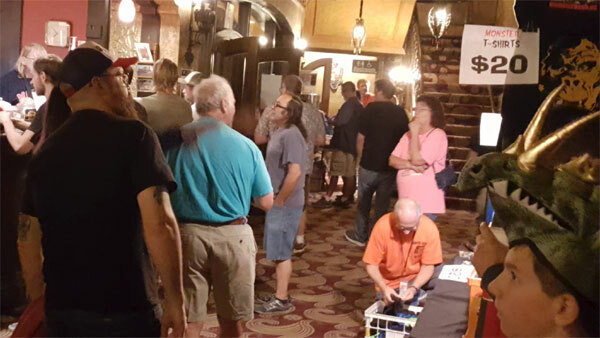 *Mark your calendars, the Monster Bash Movie Marathon happens again, next August 16-17, 2019 at The Palace Theatre in Canton, Ohio. Don't miss the fun!